KHOST PROVINCE, Afghanistan (Feb. 26, 2005) — Under the light from a pale, yellow moon, the Marines moved swiftly across the cold and barren wadi, hand and arm signals mobilizing squads and fire teams silently into position around the village. 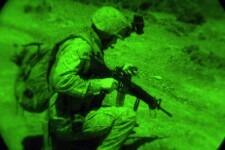 Shifting in and out of the shadow of trees and low rock walls in the surrounding fields as they neared, 3rd Battalion, 3rd Marines, sealed a seamless cordon and prepared to search for several men they suspected of perpetuating terrorist activity and attacks on Afghan and Coalition forces in the area. Only when the night’s reverie was split by the blaring sounds of psychological operations’ surrender appeals and the roar of Cobra gunships appearing a few hundred feet overhead, did the inhabitants realize they had been surrounded. By the break of dawn, the Battalion was well underway to completing one of its most successful operations to date in the region. “We moved over 44 kilometers at night, dismounted a few (kilometers) away, and surrounded the village where we believed the enemy to be hiding by moving in on foot. Our enemies had never seen anything like this before, so they weren’t ready for us and they had no chance to escape into the mountains,” explained Capt. Ken Barr, commanding officer, Weapons Co., 3rd Bn., 3rd Marines, whose company planned the operation over a month and a half, gathering key human intelligence on anti-government militia forces operating in the Khost province. Over the course of two days, Weapons and Headquarters and Service Companies, who combined forces for the operation, set up shop quite literally in the suspected terrorists’ backyards. Both companies are organized as provisional rifle companies in the Battalion’s expansive area of responsibility. The battalion was able to capture eight men believed to be members of anti-government militias and seize a significant amount of illegal weapons and explosives. And they did it without a single shot being fired. One of Weapons Co.’s platoon commanders explained the relationship that they have tried to foster in the area over the course of the last few months that has improved their successes and ability to go in hard and fast without disrupting friendly ties. The Marines and sailors of 3/3 are operating with a high level of cultural and societal awareness and attention to detail in order to strike a certain balance with the local populace during security and stability operations, said Barr, something he believes is a reflection of his Marines’ professionalism as they complete more complicated missions. When Weapons Co. entered the village, the commander’s first action was to meet with the village elders and give them a chance to give up the men who were wanted in connection with the attacks. It was that approach that led to the operation’s success, said 3/3 Battalion commander Lt. Col. Norm Cooling. The Marines of 3/3 were very successful in their searches, which were done with the supervision of the town’s elders. In the suspects’ homes they found everything from grenades shoved into sacks of flour, to weapons buried in dung heaps, and plastic explosives and blasting caps stuffed in an old car tire. One squad even recovered a belt of illegal armor-piercing AK-47 rounds hidden under an infant in a crib. Weapons Co. plans on following up their successful round-up of suspected terrorists with medical assistance operations in the area. 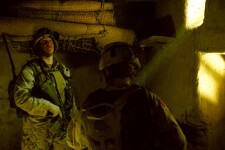 America’s Battalion continues to operate throughout Eastern Afghanistan in support of Operation Enduring Freedom. Captain Ken Barr. Weapons Company. Khowst Province, Afghanistan. February 2005.